Bilingual (Slovak-English) and trilingual (Slovak-English-German) signs are not unusual in Bratislava - in fact, the aforementioned rather friendly clinic employs them routinely, considering the large number of foreign residents and Austrians who either live here or come here to get high-quality medical care (especially dental) at a very low cost. But this is the first time I've seen the ubiquitous (in hospitals and clinics, that is) "Don't knock" sign translated into Chinese. Why did this particular immunology clinic put up this sign, I don't know. 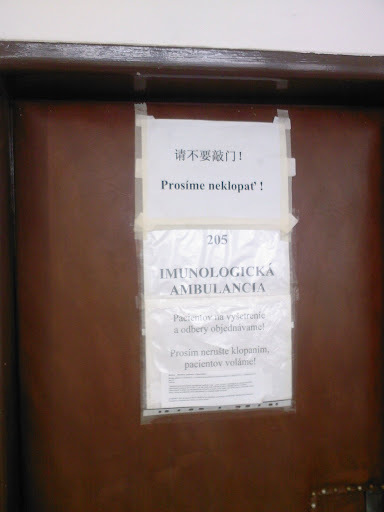 Bratislava does have a relatively large Chinese community, yet somehow I doubt its members are particularly susceptible to alergies and autoimmune diseases, considering that this was the only door with a sign in Chinese. Seeing as I get about 4000 hits when googling the phrase in quotes and Google Translate provides this very phrase as the translation of "Please don't knock", I suspect it's indeed proper Chinese. Please don't hesitate to correct me if I'm wrong. That would certainly be interesting, just consider Engrish. With China playing an ever increasing economic and political role on the global stage, Chinese is bound to increase in importance and stature and will inevitably be used by people as clueless about it as the authors of the many Engrish texts are about English. Is it possible that I have just witnessed the birth of Hanyish or perhaps Zhongwenish?